The recognition of homeopathy as a science by the scientific community is problematic. The materialism paradigm, the paradigm that only material, physical and chemical things can be an object of science, is blocking it’s recognition. The materialism paradigm though is unnecessary for science as such, and is even blocking it’s own development. When adversaries of homeopathy are attacking it, one of their first remarks is that “there’s nothing in homeopathic remedies”. And in a sense they are right: there’s “no thing” in it. Homeopathic remedies are not very interesting chemically, but they have that in common with many things in our culture like books, magnetic cassettes, CD’s and DVD’s. CD’s are chemically all the same, but we use them for many different purposes like music, movies and software. The similarity is that all are interesting because of the information that is on the carrier. In books, ink is spread on paper in such a pattern to contain information. On cassettes magnetic fields are impressed in special patterns. On CD’s little holes are burned in a special pattern. In homeopathic remedies a pattern is impressed on the water and lactic sugar. In science we generally find two paradigms that are essential for science, order and truth (see Homeopathy and Science). But there is also the materialist paradigm "only the material world can be object of scientific research”. The materialism paradigm is obvious in our culture and especially in medicine. It leads to the denial of the existence of emotions and thought which are seen as just chemical and electrical reactions in the body. Or the problem is avoided by reducing the internal problem to something objective: intelligence is the outcome of some test, and what it really is we don’t know and cannot be known. In 1845 (Decker, Verbrugh) the Berliner Physikalische gesellschaft was founded with the basic assumption, that no other forces than the physical and chemical are working in the living nature. The paradigms can be found everywhere in the scientific literature. Crick states it thus: “Our own view is that it is a plausible working assumption that some activity of the brain is all that is necessary to produce consciousness” and “The important first step is to find the neural correlate of consciousness”. Daniel Dennett says that computers will develop consciousness by itself when they will raise a certain level of complication. The discussion has centered often around the homunculus. The homunculus is, as Crick says it, usually thought of as a "little man inside the head", who perceives the world through the senses, thinks, and plans and executes voluntary actions. It was “postulated” to explain the human experience of emotions, thoughts, volition and consciousness. The homunculus is for the body what the driver is to the car. But because it couldn’t be found by dissecting the body it was dismissed. Verbrugh states that since 1850 the materialism paradigm isn’t spoken loudly, it has become an unspoken, hidden axiom or paradigms. Things not conforming to the axiom are often called irrational. But rational is a quality associated with the order paradigm and not with the materialism paradigm. Or they are called unscientific, a circle reasoning. Attneave states that the first objection to the homunculus is, “that it leads to a dualism, since it might involve a fluffy kind of non-matter. . . quite beyond the pale of scientific investigation". Once I explained the principle of Diadoxis (i.e. laws of Hering) to pharmacists. They had a big resistance to it, which they expressed as that is was too “shamanistic”. What they meant was that it was incompatible with the materialism paradigm. The materialism paradigm is in contradiction with the experience of all people. People experience emotions, thoughts and consciousness. The mysterious homunculus turns out to be “I”. Crick says “We all have this illusion of a homunculus inside the brain (that’s what "I" am), so this illusion needs an explanation”. Experience can be tricky and self deflationary. For instance people experienced and thought that the earth was flat for many centuries. The explanation is that that’s true only in a limited range. When one’s scope is too limited the earth looks “really” flat. In this case we can see that the theory of the round earth also explains the human experience. We see the earth as flat because the earth is very big and our vision is too limited. But the experience of thought and emotions as something completely different from matter isn’t explained so far. The theory that thoughts are only electrical currents in the brain doesn’t explain how it comes that we experience them as thoughts. The claim is that thoughts are produced by the brain or even stronger that they are just electrical currents in the brain. But till now I haven’t seen any experiment to substantiate it. It’s an empty claim. The opposite though, is very obvious: thought form the material world. Examples are commercials, laws, religions, politics and terrorism. Designs of cars, houses etcetera form the world. Some will say the brain also produces these designs. But then the problem is how these electrical currents in the brain can be transferred from one brain to another. Psychosomatics is another form of this idea. For instance the chance of dying is highly raised within a year after the death of the spouse. Often content and form are confused. Things that look intelligent don’t have to be so. An obvious example is a calculator, which can perform complex calculations much faster and better than humans. A car looks quite intelligent driving through the streets, avoiding objects and people. Penrose cites Searle in the thought experiment “the Chinese room”. In the experiment an Englishmen in a closed room gets questions about a story; the story and questions are in Chinese, which he doesn’t understand, but he has books that tell him how to handle the texts; he replies in Chinese without understanding; although the result looks intelligent, there’s no understanding. The analogy with computers is obvious. The confusion is between form and content. A simulation isn’t the same as what’s simulated. A map is not the country. There’s a strange paradox in the materialism paradigm. Many scientists have the idea that thoughts are not really existing, but just some efficient chemical or electrical phenomena in the brain. But in that case, their own theory, which is a thought, does also not really exist. That theory would also be just an electrical current in the brain. The theory doesn’t really exist anymore. The quality of truth is something of thoughts. Material things just are or are not, but cannot be true or false. The paradox becomes clearer in the form: “does the thought exist, that thoughts don’t exist”. Bohm has put forward this idea in “wholeness and the implicate order”: the theory that thinking is just something that enhances survival means that that theory itself is just something that maybe enhances survival, but it doesn’t have any worth in itself. Science in itself is a thought, immaterial. One could say that the object of science is to find the forms in the thought world that correspond with things in other worlds (see Diagram 1 ). One can divide the world or universe in different worlds. The material world is an obvious world. The thought and emotional worlds are also worlds. Science and theories exist in the thought world. They tell something about other worlds, are models in the thought world that correspond to something in another world. Physics and chemistry create theories and models about the physical world. 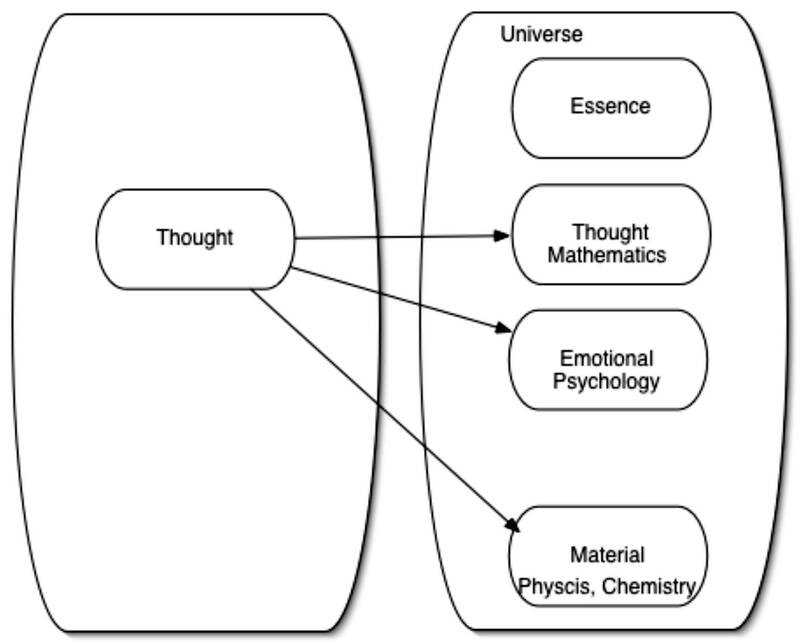 Mathematics and logic create models about the thought world. Psychology creates models about the emotional and thought world. The materialism paradigm is in contradiction with the existence of immaterial things. Examples abound, like: numbers, lines, triangles, and friendliness etcetera. These don’t exist in the material world. There may be objects that can represent for instance a triangle, but they are not real triangles. Logic and mathematics as a whole are immaterial. But their reality can hardly be denied. Present day physics would be impossible without mathematics. Proponents of the materialism paradigm say that objects like lines are not real. But that leads to circle reasoning: triangles are not real because they are not material and that’s the case because only material things are real. When mathematical objects and deductions are not real, but only some electrical currents in the brain, then mathematical theorems should be proved by measuring those electrical currents. No one is doing that and I assume no mathematician will be in favour of this procedure. The materialism paradigm isn’t that strong in physics anymore. Matter isn’t that material as it looks. But there’s something more disturbing. Consciousness has come into physics as something special. Quantum mechanics states that elementary particles can be in various states at the same time, it’s undecided which state is preferred. It’s only when an observer “looks” at the particle that it’s decided which state is chosen. This can lead to unexpected and counter intuitive conclusions, like in the famous thought experiment of SchrÃƒÂ¶dinger’s cat. In this experiment an atom is decaying in a box and the particles coming out of the decay can trigger a cascade that breaks a capsule with hydrocyanic acid in it, that will kill a cat in the box. Because the atom is an undecided state, both decayed and not decayed, the cat is also in two states at the same time, alive and dead. The observation will force the atom and thus the cat to come in to one of the two states. The consciousness of the experimenter is the decisive factor, but consciousness is a factor outside of matter, otherwise it wouldn’t have to be brought in as something special. The materialism paradigm is also in contradiction with ethics. If humans are only material bodies they could just as well be treated as cars, be demolished and broken down without getting to trial. But the materialism paradigm in fact leads to the opposite: life is something that must be continued at all cost. Living in a terrible state under cytostatics is promoted more than dying peacefully. This phenomenon, a principle leading to it’s opposite, is a strong indication that the principle has reached its limit. The origin of the materialism paradigm is probably the Christian religions. For many centuries, people had to believe ideas without being permitted to question them. The enlightenment freed itself from the limitations of beliefs. When those religions gradually turned out to be unreliable sources of knowledge, everything of them including the immaterial world was thrown away. The immaterial worlds got associated with qualities as subjective, unreliable and untrue. It ended in the idea the immaterial worlds are non-existent. The confusion is associated with the qualities “objective” and “subjective”. The material world seems to be the same for everyone, so one can call it objective. The thought world seems to be different for everyone, so it’s called subjective. It’s seen as unreliable and not true. But here two kinds of truth are confused. A thought can be true in two ways. It can be true in the sense that it’s reflected in the world. The thought “that apple falls” is true when the apple is falling. But a thought can also be true as a thought. The thought “that apple falls” is true in the sense that the thought is thought. It exists in the thought world, it’s objective there. The thought world is not always different for everyone. When people are talking to each other there thought worlds are partially the same. A German philosopher once suggested to me that the healers will produce the paradigms of a culture. The doctor or healer has from ancient times been associated with the priest or prophet and the prophet is in contact with God, so he shall know the truth. This explains why the materialism paradigm is the hardest in medicine. - the law of Similars needs consciousness as an explanation; the mirroring of the disturbance leads to consciousness and in that way to cure. In this sense homeopathy is similar to psychotherapy like logotherapy (Frankl), paradoxical therapy and behaviour therapy. This incompatibility with the materialism paradigm is the real motive that homeopathy isn’t recolonized in many countries. There’s a strong correlation between the strength of the materialism paradigm and homeopathy not being recolonized in countries. In India and Brazil with a more spiritual attitude of the population homeopathy is recognized. In northern European countries and the USA with a strong materialism attitude homeopathy is out of the universities. In his desire to dismiss the results, he even stated that double blind studies can lead to false positive results and should be reconsidered. It seems that the basis of medicine, the double studies (RCT), can be thrown away more easily than the acceptance of homeopathy. Vandenbroucke forgot to consider that it’s not at all necessary “to dismiss of a complete building of chemical and physical insight”. It’s only needed not to limit oneself to it. The materialism paradigm is very strong in our science and culture. Every phenomenon is forced into that paradigm, even when it doesn’t lead to results. For instance, Crick tries to explain the consciousness as a function of the brain; he discusses how vision works in the brain, but the discussion is all about what happens before it comes to “seeing”; he ends with: ”How this activity (of the brain) acts to produce the subjective world that is so dear to us is still a complete mystery”. The paradigm often seems to be more a belief or axiom than a scientific fact. In this sense science looks like a religion and scientist like priests. And even more so the doctors in their pure white clothes, who can see right through you with their scanners and who know what disease you have even when you don’t know it yourself and who help you in your heroic fight against the evil, the disease. What does this mean for the road to get homeopathy recognized. The first way is to prove it works. This has been done successfully, but it didn’t convince scientists. The incompatibility with the materialism paradigm blocked recognition. Wichmann suggested the solution to drop the science aspect of homeopathy: “… though there are characteristics of homeopathy that look scientific at first, … homeopathy rests on a tradition that is hermetic, … in the same line as shamanism and alchemy”. This solution means to conform to the combination of science with the materialism paradigm. Alchemy and shamanism are sciences too, although they don’t conform to the materialism paradigm, and although there may have been many incorrect forms. Another direction to go, is to bring the materialism paradigm up for discussion. A paradigm is harder to break down when it’s not formulated openly. To put it into homeopathic terms: “Healing of a delusion is only possible after it has been brought to consciousness”. And that’s also my experience in discussions with scientist adhering to the materialism paradigm: the discussion becomes more open instead of aggressive. Another option would be to present homeopathy as an information science or cybernetics: homeopathic remedies give feedback about the imbalance of the system and the system corrects itself. This representation would probably be more acceptable for most scientists. But it hides the real problem. Information looks very innocent and acceptable to scientists in these days of computers. But information is only information when there’s consciousness. In reality information is immaterial. Attneave F., In defense of homunculi, in: Rosenblith WA, Sensory Communication, pp. 777-782. New York, NJ, MIT Press and John Wiley, 1961. Bohm David, Wholeness and the Implicate Order, Routledge, 2002, ISBN 041528979. Chalmers D (1995) The Conscious Mind: In Search of a Fundamental Theory. New York, NY: Oxford University Press. Churchland PM, Churchland PS (1998) On the Contrary: Critical Essays, 1987-1997.Cambridge, MA: MIT Press. Crick F, The unconscious homunculus, in Metzinger T., Neuronal Correlates of Consciouness, pp. 103-110, MIT Press, Camrbidge, 2000. Crick F, Koch C (1998) Consciousness and neuroscience. Cerebral Cortex 8:97-107. Decker H.S., The Medical reception of Psychanalysis in Germany 1894-1907, Bull Hjst. Med. XLV 461-482, 1971. Debats F, Diadoxie, Utrecht, 2000. Dennett Daniel C., Consciousness Explained, 1991. Freud S (1915) Das Unbewusste. Int. Zeitschrift Psychoanal. 3(4): 189-203 and 3(5):257-269. Hadamard J (1945) The Mathematician's Mind. Princeton, NJ: Princeton University Press. Jackendoff R (1987) Consciousness and the Computational Mind. Cambridge, MA: MIT Press. Jackendoff Ray, Foundations of language, Oxford New York, 2002, ISBN 0199264376. Metzinger, T (1995). Einleitung: Das Problem des BewuÃƒÅ¸tsein. In: BewuÃƒÅ¸tsein, Metzinger, T., ed., Paderborn, Germany. Penrose Roger, The Emperor's New Mind, Oxford UK, Oxford University Press, 1989. Penrose Roger, Shadows of the Mind, Oxford, UK, 1994. Penrose R (1997) The Large, the Small and the Human Mind. Cambridge, UK: Cambridge University Press. Poggio T (1990) A theory of how the brain might work. Cold Spring Harbor Symp. Quant. Biol. 55: 899-910. Searle JR (1997) The Mystery of Consciousness. New York, NY: The New York Review of Books. Shear J (1997) Explaining Consciousness: The Hard Problem. Cambridge, MA: MIT Press. Siewert, C.P. (1998) The Significance of Consciousness. Princeton: Princeton University Press. Verbu H.S., Geneeskunde op dood spoor, Rotterdam, 1972, ISBN 9060691253. Wichmann JÃƒÂ¶rg, Defining a different tradition for homeopathy, Homeopathic Links, Volume 14, 4/01, 2001.